Well... Maybe not ALL, but a lot more than was well yesterday. This will be pretty short. It's mostly an attempted practice at full implementation of the laptop as my primary computin' box. (Not going so well so far.) Also a practice of posting pictures from the laptop and integrating them into the Travelogue (something I didn't do very well last time). More on that later. The movers from Royal Hawaiian Movers arrived at 0755 this morning. Five minutes early. This wasn't a problem, it was actually rather welcome. These movers were far and above the best movers I've ever had the pleasure of dealing with... They arrived sober (one up on the movers in Virginia). They didn't try to redistribute all of our stuff and disorganize everything (one up on the movers in Guam). They were friendly, they worked efficiently, and they did an all around great job. Round about 1600 they did all they could do for one day and packed up and left with seven crates full of our stuff. We've still got some stuff laying about but for the most part all of our storage stuff is gone. Last week I got a call from a fellow CAP Squadron member. He was requesting that Tamara and I do what we could to make it to the next squadron meeting. I hadn't planned on going, what with it being pack-out day and all, but he seemed pretty adamant about it so we made sure the movers knew we needed to clear out in time to make it to the meeting. I'm glad we did. Turns out he gathered up a collection from the rest of the squadron and they all pitched in on a couple parting gifts for us. Aren't these just absolutely fabulous? 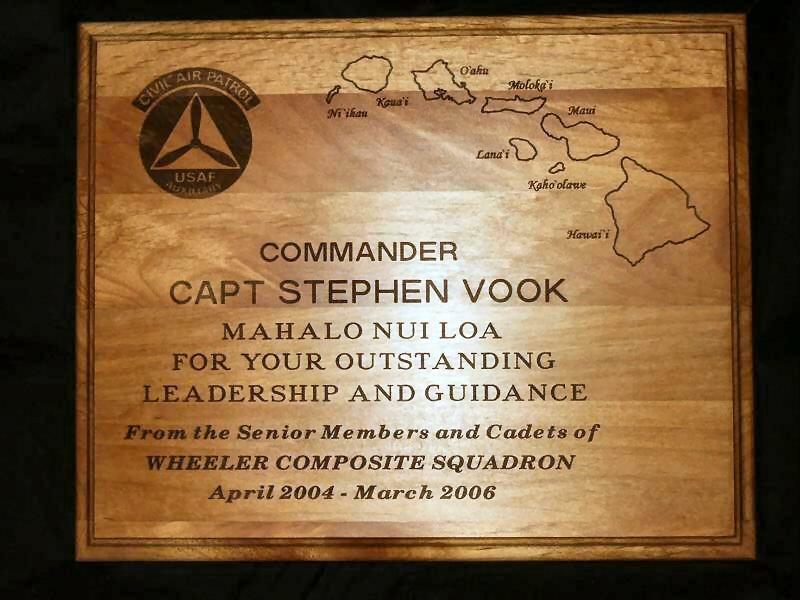 The plaque is made from Hawaiian Koa and is laser engraved. 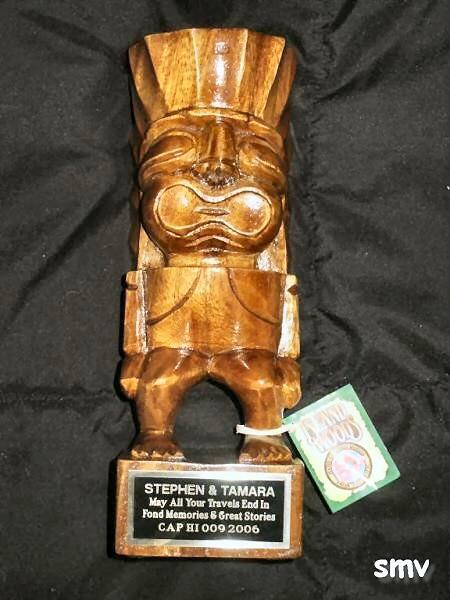 The tiki is Ku Tiki, the Hawaiian god of strength. Although I am typically a man of few words, I was really at a loss for even those few words when he presented these to us this evening at the safety meeting. I wanted to let you all know that I very much appreciate the feedback I've been receiving on these notes. I have several left to answer but there just wasn't time today. I will get to them. Thank you. Well, it's getting late and tomorrow is another busy day so I'd better wrap this up for now.